What is Chromecast guest mode? When will you need it? By default, the only way to use Chromecast is by joining your device to the same network as Chromecast. This is part of the security consideration: you don’t want your neighbor to mess up your TV screen. Sometimes, you have some guests in house and they want to share something interesting from their devices through Chromecast. In this case, you have to connect their devices to your network to use the Chromecast. 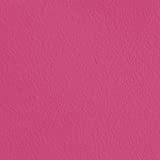 If you have some sensitive files in your home network, you probably are reluctant to have them connected to your network. You may trust your friends; but you cannot trust their devices which may have nasty malware. Chromecast guest mode comes to solve your dilemma. Thanks to the recent update in Chromecast. 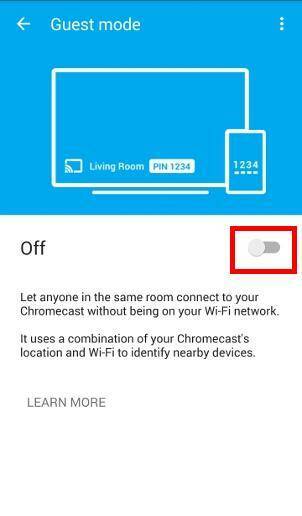 You can turn on guest mode on your Chromecast device so that your guests can use some (not all, see limitations below) features of Chromecast without connecting to your home network. How does Chromecast guest mode work? 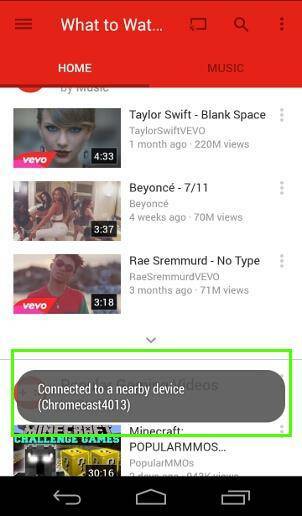 Once Chromecast guest mode is enabled in the Chromecast device, Chromecast will emit a special WiFi beacon. The compatible apps (Google cast ready apps) in the guest device can detect the presence of the special WiFi beacon and shows the Cast icon in the app. Then the guest can tap the cast icon to pair with the Chromecast. 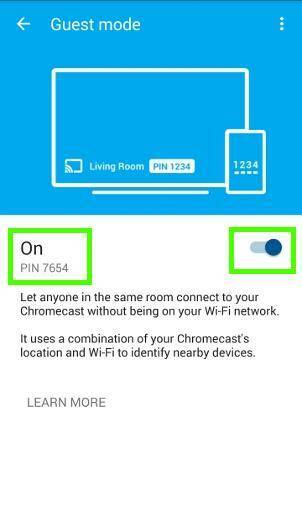 if the device is close enough to Chromecast and there are no walls between Chromecast and the device, Chromebase can “whisper” the PIN to the guest device, which will then connect to it. Chromecast actually uses inaudible (for most human ears) ultrasonic audio tones to pair with the device. The guest does not need do anything. This method only works when the device is very close to the Chromecast. if the guest device cannot hear the PIN, the guest can manually type the PIN that is shown in the TV screen. So, there is no security concern on enabling and using Chromecast guest mode. It is not necessary to turn it off unless you know you don’t need it for a prolonged period. How to enable Chromecast guest mode (and disable it)? 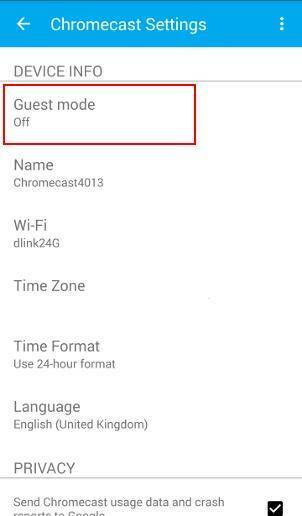 By default, Chromecast guest mode is turned off in all Chromecast devices. You can enable Chromecast guest mode from any Android devices that are connected to the same network as the Chromecast device. Step 1: Start Chromecast app in your Android device. Please try to update your Chromecast app if you haven’t updated the app for long time. Step 2: Tap Devices in the app as shown below. Step 4: Tap Guest mode in Chromecast Settings page as shown below. Step 5: In Guest mode page, drag the switch from left to right as shown below. This will turn on Guest mode for this Chromecast. The color of the switch should also change from white to dark blue. Step 6: Chromecast guest mode enabled. As shown below, once Chromecast guest is enabled, a 4-digit PIN will be generated and displayed. This PIN will also be shown on the TV screen immediately. In this page, you can drag the switch from right to left to disable Chromecast guest mode. Your guest now can cast to your Chromecast without connecting to your home network. How to cast in Chromecast guest mode? To use Chromecast in guest mode, please follow these steps. Step 1: Move guest device close to Chromecast. 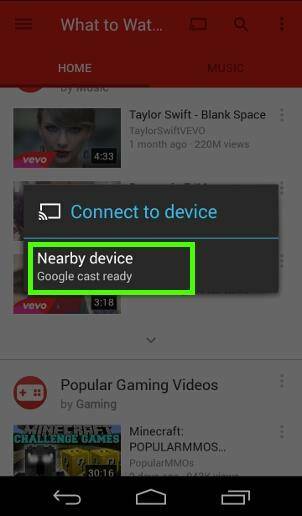 Step 2: In the guest device, launch a Google cast ready app. 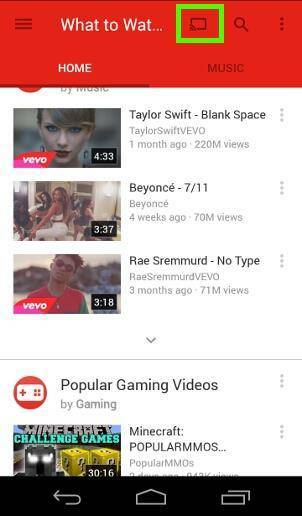 For example, YouTube. If the device is in WiFi range of Chromecast, you should see the cast icon (as shown below) after opening the YouTube app. If you cannot see this icon, close the app, move a bit closer to Chormecast and then try again. 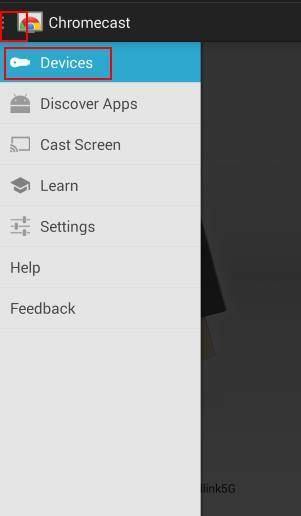 Step 3: Tap the cast icon as shown below. Step 4: Tap Nearby device as shown below. Step 5: Stream to Chromecast. Normally, if the guest device is close to Chromecast, pairing will be done automatically. 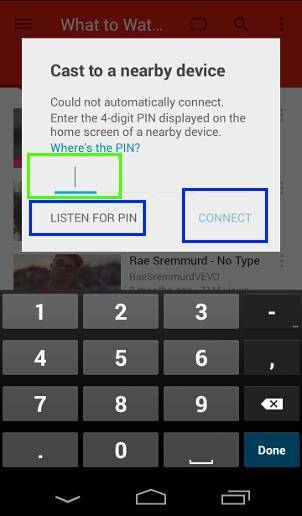 If not, you will be prompted with the option to type the PIN or listen for PIN as shown below. Once the guest device is connected to the Chromecast, a notification will be displayed on the screen with the Chromecast name. You can cast to Chromecast in guest mode now. You have similar control to stop casting in the notification area. What are the limitations of Chromecast guest mode? Android only. Guest mode works with Android devices with Jelly Bean 4.3 or later versions. No local contents from guest devices. You cannot use Chromecast guest mode to stream local content from a guest device. Google Cast Ready applications that send local media from your phone or tablet to the Chromecast do not work with guest mode. No Android screen mirroring even guest device runs KitKat 4.4.2 or later versions. Guest mode settings are persistent unless you manually change it or reset the device. If you want to change the PIN, you can turn it off and turn it on again. Do you have any questions on setting and using Chromecast guest mode? Please leave your questions, comments, and feedback in the comment box below, if you have any questions or get any problems on Chromecast guest mode. My guest mode worked perfectly fine until I recently updated my android to Lollipop. The cast screen image no longer shows for guest mode and I’m forced to use wifi on my phone everytime. Which app has this issue? Please note, screen mirroring (screen casting) is not supported for guests. All of my Chromecast ready apps now have this issue. 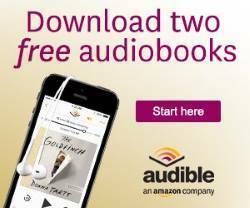 Including Netflix, Hulu, Hbo GO, Showtime Anytime and Youtube. They all detected Chromecast through Guest mode before and now they don’t. I can confirm the Chromecast guest mode works with Android Lollipop. I tested it with Galaxy S6 edge, Moto G 2014 (updated to Lollipop), Galaxy Note 4 (updated to lollipop). All of them work. You may run Chromecast app once on your Android Lollipop device (it is not necessary to connect to it). After this, for the apps, you can try to clear cache and clear data, then try again. Hello im looking for info. On how to manage the devices that are connected to Chromecast if my guest mode is off. I live in a house full of people and I don’t want them to sync with my Chromecast but they are using the same WiFi as my chromecast and my guest mode is off how do I change it so they can’t cast from there devices??? Have a nice night thanks! For Chromecast, all devices in the same network are equal. 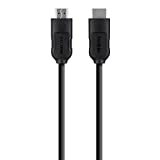 You simply cannot prevent other devices from casting to your Chromecast if they are also connected to the same network. This is not a security bug. Chromecast is designed to work in this way. It’s designed as home entertainment device, and therefore all devices in your home can access it. I am wondering why I screen mirroring does not work in guest mode? We use this for business and I would rather not allow the WiFi to be used, but the reenactment mirroring us something that would come in very handy during meetings. As explained in the page, Chromecast guest mode does NOT support screen mirroring. The reason is related to how screen mirroring work. In screen mirroring, the router is involved in transmitting data between mobile device and Chromecast. But in guest mode, the devices that are not in the same network as Chromecast cannot access the router. These devices can only pass the resource URI to Chromecast and then Chromecast takes over and fetch the resource from internet.